J’s Maintenance serving communities in partnership with Home Depot Foundation and Habitat for Humanity. You might wonder why a California janitorial firm is building homes in Tucson, but the answer is Habitat For Humanity and The Home Depot Foundation. As part of our partnership with The Home Depot, we support their foundation with financial contributions and sweat equity. This year’s event took place in Tucson and 300 volunteers from different building service contractors across the nation helped build 10 homes for future homeowners. Framing, roofing, interior walls, plywood, weatherproofing, etc. was done en masse with amazing results. We were also lucky to see the final product of our work at this same site last year, when a wonderful family took the keys to their new house in a ceremonial hand-off. Knowing that we are creating a safe and healthy living environment for dozens of families is extremely rewarding. Thank you to The Home Depot Foundation and Habitat For Humanity. We’re already looking forward to next year’s project! J's Maintenance Staff at our 2014 Home Depot Fnd. & Habitat for Humanity home build project. Laying the foundation for a families future. Framing out the house. It's all coming together. Time for someone to live their dream. 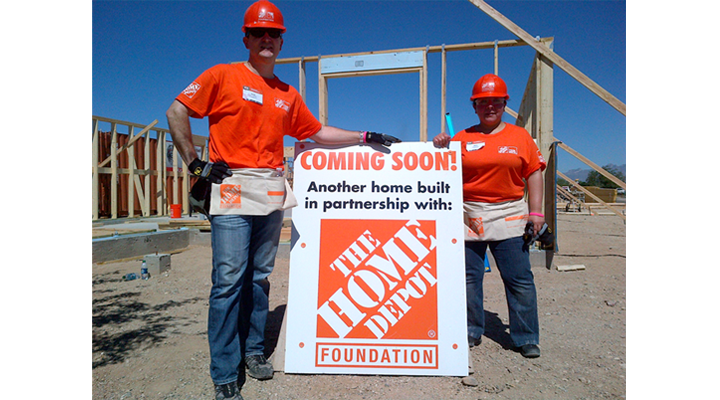 Thanks to the Home Depot Foundation and Habitat for Humanity!